Jason May continued to impress with a strong 9:14 finish, good for 2nd in the M35-39. He was 1st in his age group out of the water (50:50) and finished with a 3:19 marathon. Bill Macleoud, who all but disappeared from club running this year to focus on triathlons,showed it was all worthwhile, winning the Men's 50-54 Division in 9:47, and closing it out with a 3:23 marathon (2nd fastest in his group). Kevin Sullivan worked his way to a 11:19 finish, good for 46th in his age group (M45-49). ,,,and Cherryl Rose had a breakthrough, grabbing an impressive 2nd place in the Women's 50-54 competition with a 12:08 finish, leading her age-group competitors in with a 4:26 marathon. By virute of their awesome-ness, Jason, Bill, and Cherryl qualified for the IronMan in Kona! Congratulations to all our racers (nice work out there! ), apologies to anyone I may have missed (I'm a runner, not a triathlete, and I get distracted by all the spandex and equipment)...and we have some work to do to whittle down some minutes from those marathons. See you at the track! -- Coach Ed. 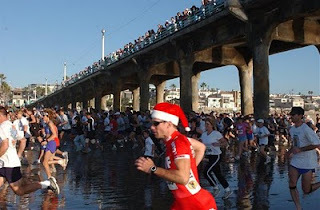 This year's Manhattan Beach Yuletide 5K will be held on Saturday, December 18th, at 2:00 pm in the afternoon. Bring all your friends and family down to the pier for a spectacular low tide in the afternoon. Stay to watch the kids race and enjoy a fabulous sunset. Kids races start at 3:00 pm. Run, Walk, or Baby Jog Along the Sea! The Only Afternoon Run in Los Angeles! Jingle Bracelets and T-Shirts For All Participants!